Laser RN is here for you! Affordable, Professional, Well-Educated, Well-Trained, as well as flexible around family and social events, business on MY terms. These were the goals I had in mind when I was dreaming of my own business. As a woman with PCOS (PolyCystic Ovarian Syndrome) I struggled with facial hair. I had several years of Electrolysis and had great results. My Electrologist was able to set her own hours and days off- I wanted that! So I did it! Incorporated in February 2001, my company slowly keep growing. Today we have several full time and part time staff, all able to enjoy making a difference in people’s lives, improving skin with hair removal, collagen treatments, chemical peels and pigmented lesion treatments. Reducing the signs of aging with botox and fillers (Debbie’s passion!) and teaching about sunscreens, skin bleaching, skin moisture etc. 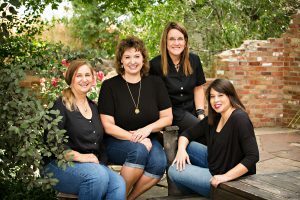 We are a clinic of strong, passionate, loving women, enjoying making a difference in the lives of the hairy, spotted, wrinkled and aging client! Laser RN Skincare and Injectables started out as Affordable Laser. We have evolved into so much more than laser hair removal that we chose to change or name to better reflect our expanding services. We will always be affordable and competitive, continuing to strive for all 5-Star reviews: customer service is very important to us. We strive to keep up on the latest and the greatest treatments, serve all of God’s children: no matter the age, color, sexual orientation- current, past or future! Go ahead, give us a try! See why thousands of clients have put their trust in us! (And sent us their moms, sisters, husbands and children) The greatest honor for us is personal referrals, this has consistently been our biggest referral source through the years. We look forward to making a positive difference for YOU very soon.